First of all, congratulations on being crowned 2016 Hong Kong & Macau World Class Bartender Of The Year. Tell us a little about the cocktail that won you the competition? Thank you very much, it’s an honour to be representing Hong Kong & Macau on the global stage. I’m looking forward to being pitted against the finalists from the other competing nations in September. The final round of the competition was the Street Food Jam – a cocktail and food pairing for which each bartender teamed up with an acclaimed Hong Kong restaurant in an attempt to create a sublime pairing of flavours, texture and visual appearance. I was teamed up with Chef Vicky Cheng from VEA Restaurant & Lounge and the dish was a Taiwanese fried dough sandwich with pigs head, chicken liver parfait, whipped Iberico lardo, carrot and radish namphrick and coriander, served in a brown paper bag – street food style. The sandwich had big-hitting Southeast Asian flavours from the spice and coriander, something that I wanted to contrast with the flavours of the drink. I felt that the dish needed citrus to balance the aforementioned flavours and to combat the oil. Tanqueray No. Ten gin was the obvious choice – a gin distilled with three whole citrus fruits, alongside a splash of fresh lime juice and ginger. These ingredients helped achieve the balance and flavour profile needed. I named the cocktail First & Formosa, as it’s a play on the English phrase “first and foremost”, acknowledging the drink’s use of oolong tea from Formosa – or Taiwan – as it is now known. A splash of soda lengthened the drink nicely and the addition of a pickled ginger granita served as a palate cleanser in between bites of the sandwich. And no Tanqueray No. Ten cocktail would be complete without an element of grapefruit, so I chose to finish off the drink with a grapefruit-zested straw. Sounds delicious. Tell us a little about yourself and how you got started in the industry? And what is the best part of your job? My grandmother saw an advertisement in the post office window one day, for a part-time bar position in the local pub and persuaded me to go for it. The first drink I can remember pouring was a pint of 1664 for a stony-faced Englishman. The glass was half foam… needless to say he wasn’t happy. After moving to study in London, I began learning cocktails at Casa Blue on Brick Lane, followed closely by Caravan King’s Cross-for a very educational two years spent learning more about flavour and focusing on cocktails. Best part of the job? Opening guests’ eyes to flavours they thought they didn’t like, and having guests leave the bar in a better mood than when they came in! What classic cocktails should more people be drinking? A Southside Royale is an incredibly delicious gin cocktail made with a splash of lemon juice, mint and sparkling wine. I can’t recall meeting anyone who didn’t enjoy a Southside. And the Martinez is delicious old world cocktail with a flavour profile that will appeal to Manhattan and Negroni drinkers alike – made with sweet vermouth, gin, maraschino and bitters. Who has been your biggest influence in the industry? Sam Jeveons has been a really influential figure for me over the past couple of years. During a number of events working with him, I’ve been able to learn methods of working efficiently, and how to work best for different types of client. I wouldn’t have the knowledge and skillset I have now without his mentorship. 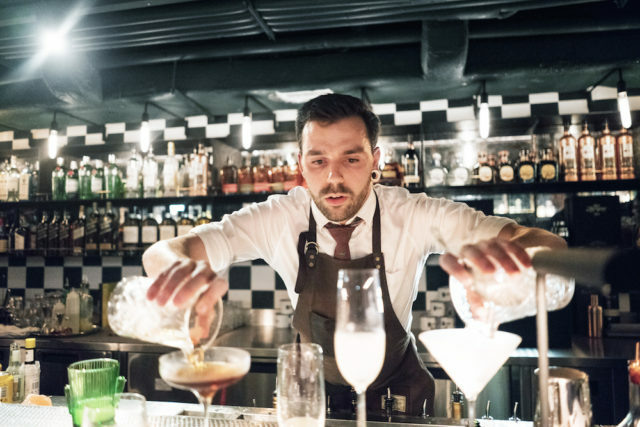 I’m very fond of the precise, methodical approach to bartending in Japan and the romanticized notion of it being viewed as a craftsman’s profession. Omakase, which can be interpreted as “I’ll leave it up to you” or “to entrust”, is a style of hospitality that requires a high level of knowledge and skill. I find it really intriguing. I was fortunate enough to have a seat at Hidetsugu Ueno San’s High Five Bar in Tokyo last year. Every aspect from guest-interaction, ambience and of course, the drink, were almost faultless. The considered approach and attention to detail he applies to all areas of his work is breathtaking. How do you prepare when competing in a cocktail competition? Manage your time properly and be strict with yourself in the build-up to the big day. Start preparing as early as possible to avoid a last minute rush, and learn your pitch off by heart. I make it a priority to go over my pitch repeatedly to the point that I know it inside-out before going in front of the judges. Get a good night’s sleep if possible, and do some exercise to shake off any nerves on the day. What is the biggest drinking trend now and what do you predict the next trend will be? Aperitivo cocktails including the Negroni and Americano appear to be the in-vogue cocktails at the moment in Hong Kong. Drinkers are becoming more acquainted with bittersweet flavour profiles and increasingly fond of spritz cocktails, with Aperol leading the charge. I think batched and aged cocktails are going to steal the limelight in the near future, with many bars focusing on customized “rested spirits” programs – think barrel-ageing, turned up a notch. What does the Hong Kong Bar scene need more of? Destination bars in natural settings. Hong Kong has an abundance of natural beauty, and it would be amazing if there were a few spots for great cocktails on places, such as Shek O and South Lantau, to grab a good daiquiri. What local ingredients, do you like to introduce to your customers that they might not be so familiar with? At 208 Duecento Otto, the bar program goes hand-in-hand with the theme of the restaurant, which is rustic Italian cuisine. Because of this, we don’t use local ingredients too often when making drinks. Having said this, I’ve been trying out a number of tea cocktails recently, using pu-erh, oolong and white teas. Creating tea liqueurs is also a project I’m planning to work on in the near future. What advice can you give to anyone looking at joining the industry as a profession? Write down your recipes from day one! I find it really interesting to revisit old recipes and apply new techniques to them to create second and third versions. Secondly, keep an open mind in all situations. If you think you know it all you will stop learning! Lastly, don’t settle on the first good idea that you land on. Adopt the mindset that good is the enemy of great, and ask as many peoples’ opinions as you can. Stay thirsty!